The Rufous-Tailed Hummingbird is one of the most common hummingbirds seen here in Costa Rica. It is named after its very distinct rufous colored tail. It has a very pink bill and a bright green body that appears to glitter when the sunlight hits it just right. The Rufous-Tailed Hummingbird is very territorial. When other hummingbirds try to feed on its area of flowers it will make an aggressive dive towards them which results in their retreat. Their wings flap at an impressive 60 beats per second and they like to feed on nectar and small insects. They are typically found in gardens and particularly like the colorful flowers on the rabo leon bushes. Even though they are very common I still look forward to photographing them to capture their beautiful colors in the right light. 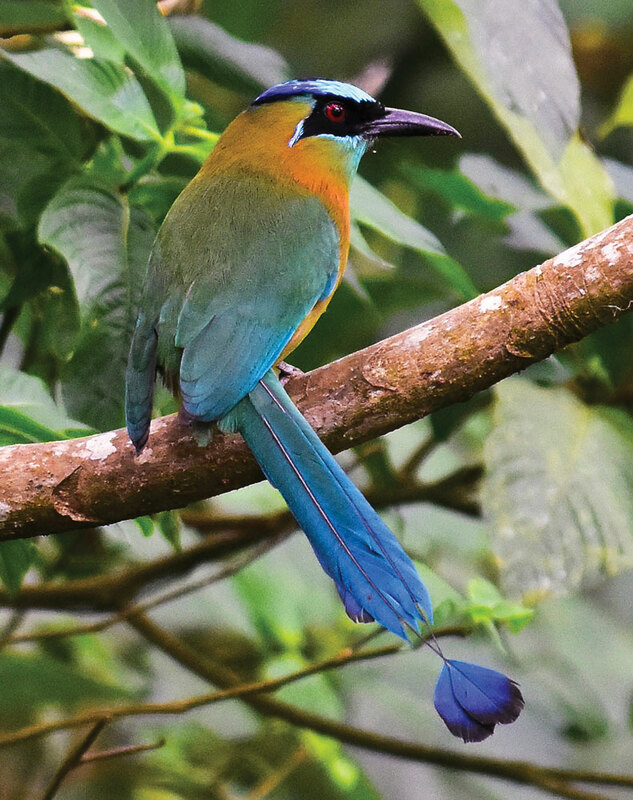 One of the most colorful birds found here in Costa Rica is also a personal favorite of mine. The Resplendent Quetzal has iridescent feathers that can show colors of green, cobalt blue, lime, yellow, and ultramarine. It’s body can appear green, gold, or blue-violet also depending on the light. The chest is a bright red and it’s bill is a bright yellow. To watch it in flight is an eye opening experience that one never forgets. Only the male has tail feathers that can extend over 2 feet long during mating season. They are found from southern Mexico down into Panama. But the best place to see them is right here in Costa Rica in our protected forests. Resplendent Quetzals will eat small insects and an assortment of fruits but their main food is wild avocados. My favorite place to see them is either in San Gerardo de Dota or Santa Maria de Dota. They are in the Trogon family and their large eyes have helped them adapt to the low light of the cloud forests. 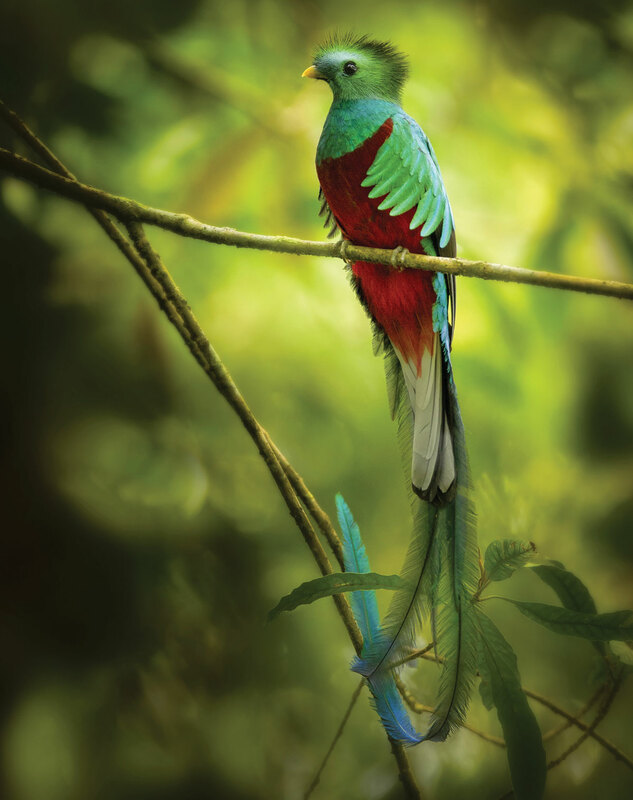 Resplendent Quetzals are classified as near-threatened due to the loss of habitat but are flourishing in the above mentioned areas, as well as in the Monteverde cloud forest. 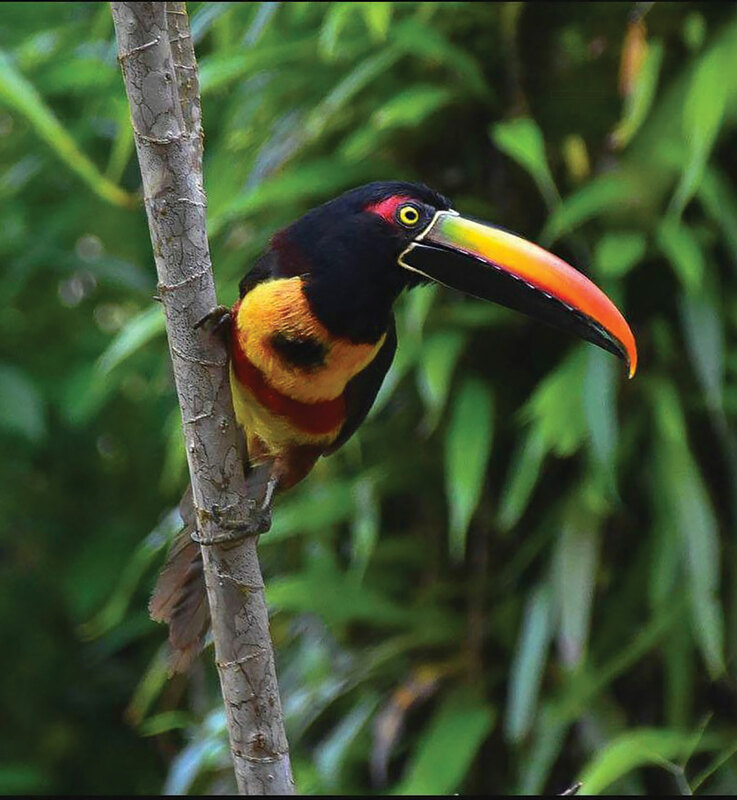 Fiery-Billed Aracaris are members of the Toucan family. I think of them as their smaller cousins. They are one of two types of Aracaris found here in Costa Rica. The other is the less colorful Collared Aracari. and in western Panama. This one was photographed in the Dominical area. 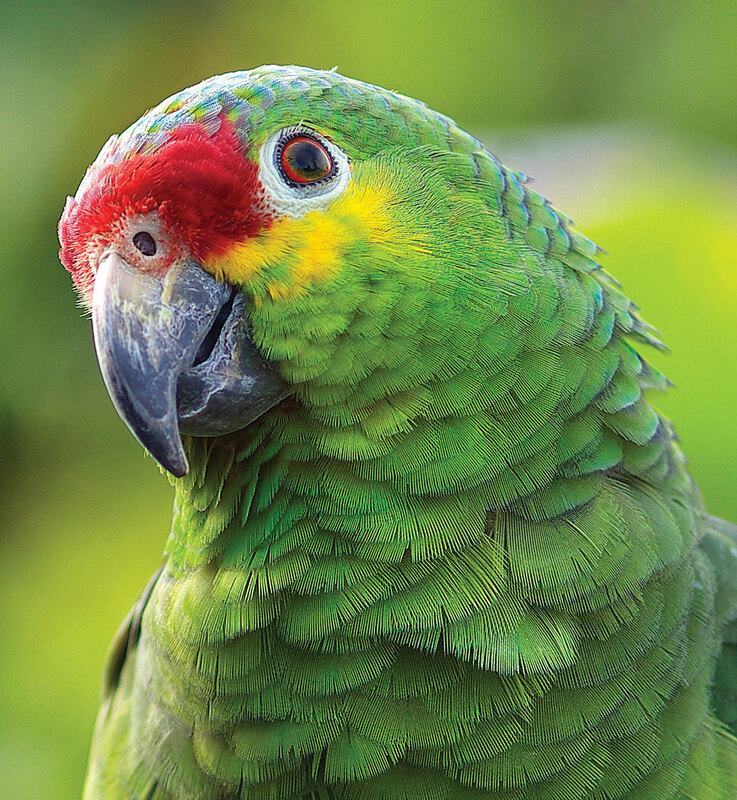 bright feathers are a stark contrast to the green of the rainforest. They are not graceful flyers and can often be seen hopping from one branch to another. You will have a better chance of seeing them when they are most active. That’s when the weather is a bit misty and not too hot. 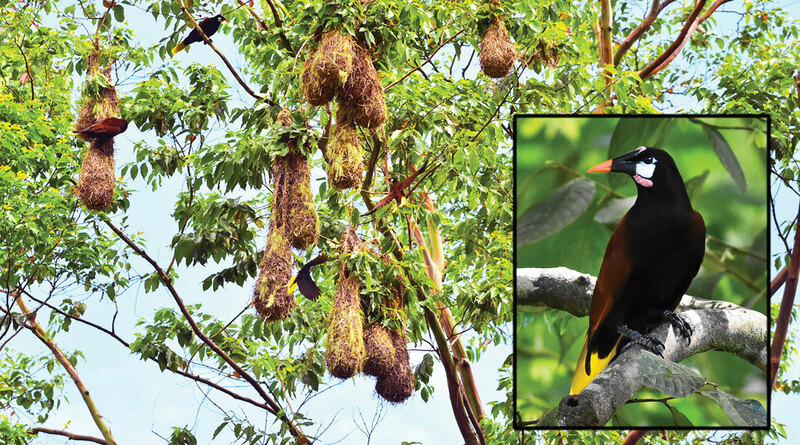 They can often be seen feeding in papaya trees when the fruit is ripe and also in Cecropia trees.